Oman Air, the national carrier of the Sultanate of Oman, won the Customer Delight Award in a colourful event held in Dubai very recently. The award organized by MENAA (Middle East, North Africa and Asia Award) was received on behalf of Oman Air by its Country Manager for United Arab Emirates, Shahzad Naqvi. This prestigious award is in its fifth year and recognizes remarkable business leaders and companies for their continuing commitment to excellence as well as developing best practices and innovative strategies. 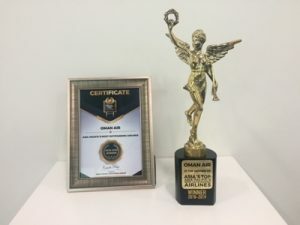 Oman Air, was also named as the winner of the ’Asia Pacific Outstanding Airline’ award at the Now Travel Asia Awards held in Chengdu (China) recently. It is the second year in a row that Oman Air has received this award – voted for by the readers of Now Travel Asia magazine. The award was received on behalf of Oman Air by Regional Vice President Far East Hamad Al Harthy and Country Manager Thailand Joe Cusmano. This award recognises the commitment of Oman Air towards travel and tourism in Thailand and Asia Pacific and in providing their guests with quality, comfort and a seamless passenger experience. 2018 has been a stellar year for Oman Air. Apart from winning a multitude of awards and accolades, Oman Air also added 8 brand new aircraft to its growing fleet and opened three new destinations namely, Istanbul in Turkey, Casablanca in Morocco and Moscow in Russia, as well as resuming operations to Maldives.